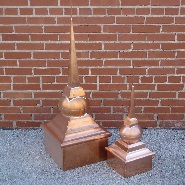 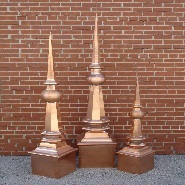 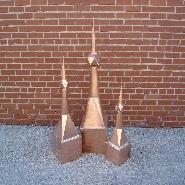 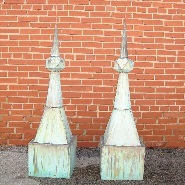 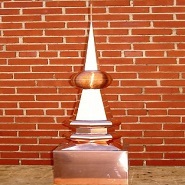 We carry several styles of copper finials (copper spires). 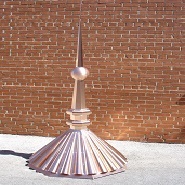 We offer the standard gem top copper finials, the classic bell design copper finials, and the turret gem top copper finials. 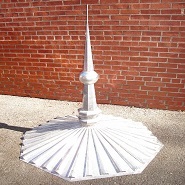 For builders (or other interested parties), that have a minimum order of 12 finials, we will offer a unique and exclusive finial design, that will not be replicated or sold elsewhere. 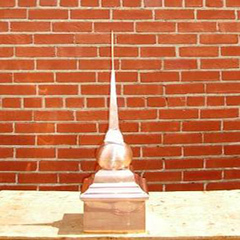 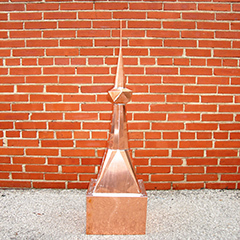 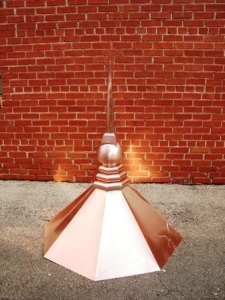 Our copper finials, also known as copper turrets, copper spears, and copper spires, are made with 16 oz copper. 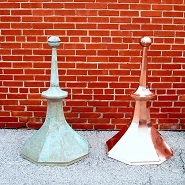 Although we keep our standard finials in stock, each of our copper finials are handcrafted individually, therefore, custom orders are welcome. 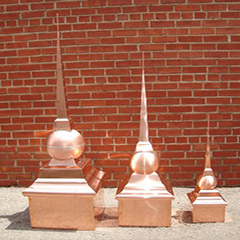 Copper will last a lifetime and does not rot like wood, rust like steel, or crack like clay. 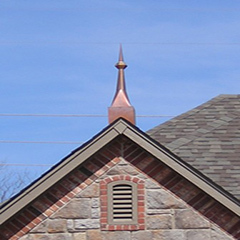 Copper finials provide an elegant finishing touch to any structure. 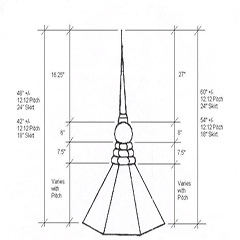 The proper size of a finial will mainly depend on the scale of the structure you would like to add the finial to. 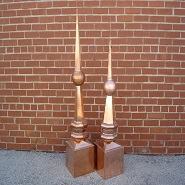 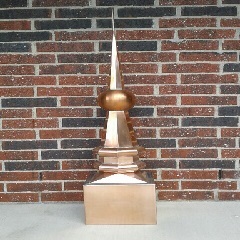 The finials average weight is 15 pounds so support is usually not a huge factor like it is for our cupolas. 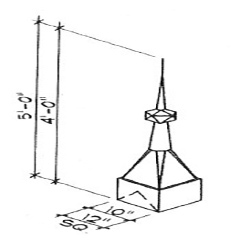 The height of the product is based on your desire, however a one­story home would usually have at least a 10″ x 10″ x 48″ finial. 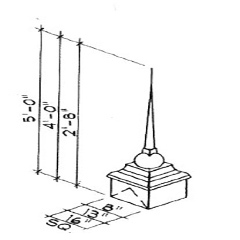 An elevated one­story home or a two­story home would usually have at least a 12″ x 12″ x 60″ finial. 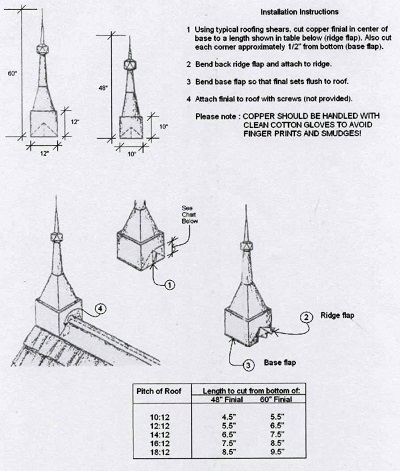 Please provide roof pitch when ordering. 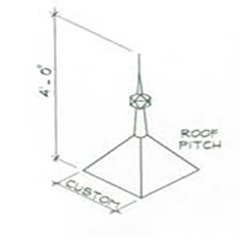 NOTE: See our FAQ page for measuring roof pitch. 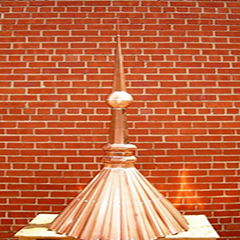 Standard Gem Top Copper Finials, Chicago Ridge Copper Finials, and Classic Ball Copper Finials must be modified on site to match roof pitch. 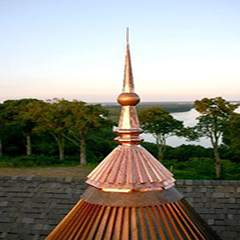 Use clean, protective gloves when handling and installing copper finials, copper turrets, copper spears, and copper spires. 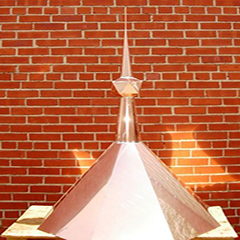 Cut each corner approximately ½”. 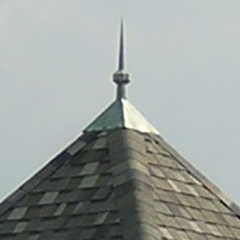 Bend back the ridge flap and attach to the ridge. 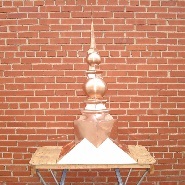 Bend the ridge flap so the base of the copper finial is flush with the roof. 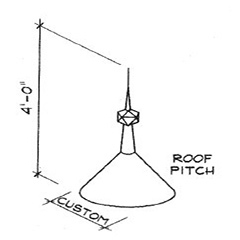 Attach finial to roof with sheetrock screws.